Love, Mrs. Mommy: Melitta Coffee Prize Pack Giveaway! 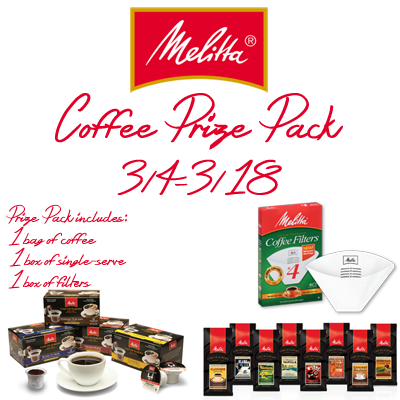 Melitta Coffee Prize Pack Giveaway! Enter for your chance to win this wonderful prize pack. A yummy way to get warm! Prize: Prize pack including winner's choice of Café de Europa Ground Coffee, 1 box of single serve coffee and 1 box of filters.